WASHINGTON, D.C. -- Less than a third (29%) of Americans are satisfied with the way things are going in the U.S. in March, essentially unchanged from February. Satisfaction has exceeded 30% once since March 2015, just prior to the November 2016 election. These data, from a March 1-5 Gallup poll, underscore Americans' continued low levels of satisfaction with the direction of the country. The current 29% who are satisfied is below the 37% average since Gallup began asking the question in 1979. 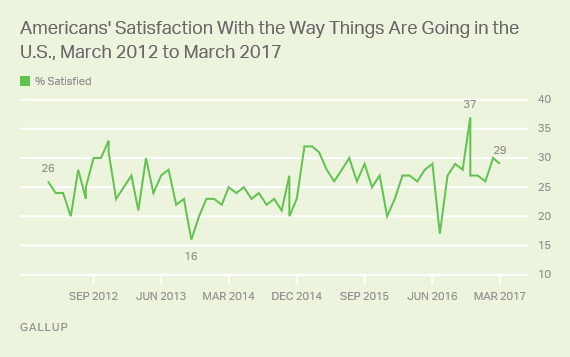 Over the years, Americans' satisfaction with the way things are going has ranged from a high of 71% in February 1999 to a low of 7% in October 2008. The high occurred during the dot-com boom, while the low occurred in the midst of the 2007-2009 Great Recession following the passage of the highly unpopular Troubled Assets Relief Program. A majority of Republicans, 54%, say they are satisfied with the direction of the U.S., while 13% of Democrats say the same. Both parties' satisfaction levels are virtually unchanged from last month, despite a flurry of controversy that has beset President Donald Trump's administration, including the resignation of National Security Adviser Michael Flynn over allegations of potentially illegal contact with Russian officials and the withdrawal of Andrew Puzder's nomination for Secretary of Labor in the face of significant opposition. Both Democrats' and Republicans' satisfaction levels shifted substantially between January and February, spanning the final days of Barack Obama's presidency and the beginning of Trump's. Republicans' satisfaction with the direction of the country surged 33 percentage points from 22% in January to 55% in February and then stabilized at 54% this month. The change in Democrats' satisfaction level was less dramatic but still large -- a 14-point decline from 27% in January to 13% in February, with the satisfaction holding steady in March. Gallup has previously found shifts in satisfaction levels among party groups after changes in presidential administrations. But the 33-point increase in satisfaction among Republicans in February was the largest shift Gallup has recorded after a change in presidential administration. 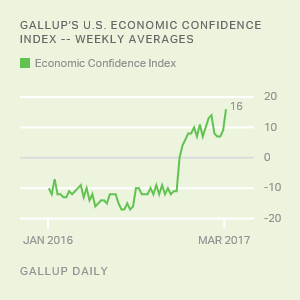 Despite Gallup's U.S. Economic Confidence Index having risen to a post-recession high of +16 and 87% of Americans indicating they are satisfied with their personal lives, Americans' satisfaction with the direction of the country remains low. Gallup has noted a broad pattern where individuals rate their personal lives or local conditions more highly in comparison with the country as a whole. Therefore, Americans' continued dissatisfaction with national conditions appears to be influenced by more than the health of the economy or how things are going in their own lives. In Gallup's most recent poll, the top problem Americans identified with the country was "dissatisfaction with government or poor leadership," likely contributing to current continued low levels of satisfaction with the direction of the U.S. It is also clear that political concerns are affecting satisfaction: The low readings among Democrats and independents bring the measure down despite much higher levels of satisfaction among Republicans. Job approval of Congress dipped in March to 24%, down from 28% in February. Republicans' approval remains much higher than Democrats' and independents'.